1. It’s hard to standardize the manufacturing process, and it spoils quickly. Both of there reasons, in the minds of cheese producers, make it a product that’s not worth their time and effort. But, for me to be writing this article, there must be some kind of redeeming factor. Right? Actually, not only is there redemption for this cheese, there’s also an explanation as to why it was NEVER mass produced, even in it’s hey-day in the deep south. Ask any southerner that was alive before 1960 about hoop cheese, and they’ll probably tell you that they bought it at a market, cut fresh off the wheel. Nine times out of ten, it was actually cut and weighed on a machine that was made specifically for store’s use. Not only did the store cut it off the wheel, they probably made the cheese in the back-of-the-house. At the very least, someone in the nearby community made it, and sold it to the store for immediate sale. Because the cheese is a fresh farmer’s cheese, and spoils much quicker than the aged cheeses that the store could outsource and keep on hand. It will only keep for about a week or two after it’s been made, and cutting off of the wheel increases the surface area which shortens the spoilage time. So it was in the best interest of the store to be able to get in in the door, and out the door, as quickly as possible with as few cuts as possible. 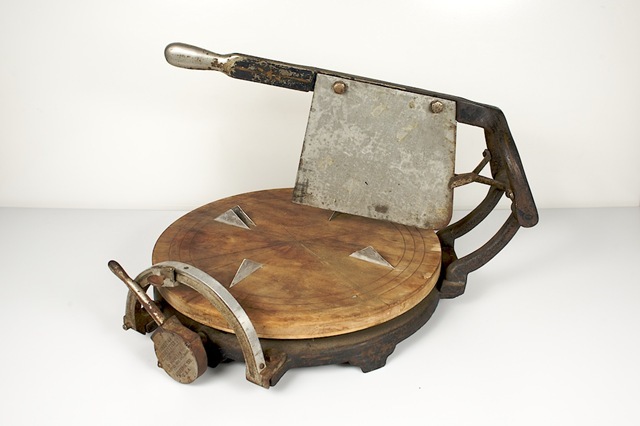 I’ve included a picture of a hoop cheese cutter/scale machine below. The thing that makes hoop cheese stand out among all the other cheeses in your dairy case, it it’s ability to impart a distinct creaminess to cheese based dishes, while keeping it’s flavor profile limited. I like to use it in combination with a sharp cheddar to offset the bite, and keep my dishes from becoming blocky or sticky. Not to mention, because it has a neutral flavor, it’s WONDERFUL when paired with fruits. It makes the sweet taste of strawberries or melons sing out while giving a firm creamy texture to the palette. Simmer apples in boiling water until tender. Drain and place a layer in a buttered casserole. Combine remaining ingredients and sprinkle over apples. Repeat layering until all ingredients are used. Bake at 350 degrees, 35-45 minutes. So what’s your best bet for finding hoop cheese? Occasionally you’ll find it in a local supermarket. But, your best bet will be to find a farmers market. You might be surprised to find that in addition to the vegetables and preserves that frequent the market, local artisan cheese makers often make an appearance too. This entry was posted in Cuisine, Culture, Recipe and tagged Cassarole, Cheese, Cooking, Dairy, Devices, Farmer's Cheese, Food, Fruit, Fruit & Cheese, Nouveau Southern, Rare, Recipe, Southern, Southern Food, Tradition. Bookmark the permalink. Hoop cheese is the perfect cheese for good baked mac n cheese as well.. it melts evenly, isn’t clumpy or oily and keeps the texture nice and creamy. My mother used hoop cheese in her cheese cake recipes. They came out smooth and creamy, with a melt in your mouth texture that is not found today, in restaurant or bakery cheese cakes. I have a great NY style cheesecake made with Hoop cheese which my family loves. However, I can’ find Hoop cheese here in the South Bay of California. The Hoop cheese I have used was white and soft. My father’s family, who were “yeoman farmers” like everyone else in the North Mississippi county (i.e. subsistance farmers with just enough cotton crop to send the kids to school), traded in town for the things they did not produce for themselves. As you might imagine, there were not many luxuries, but at Christmas there was always pepermint candy and hoop cheese. By family tradition, it was always eaten together. I can’t get hoop cheese now, but my family contiinues the tradition with Cheddar or Colby. Tastes like Christmas to me! If you can’t find any hoop cheese from a local purveyor, some Whole Foods Markets have a very wide selection of cheeses. The last time I visited one, I saw both red-rind, and black-rind hoop cheese. Anybody got a recipe for making hoop chhese? I’m in the process of looking for recipes like this so if you have others that might be useful, I’d love to hear from you. Part of a ‘keep it simple’ lifestyle. I wonder if waxing the hoop cheese would help it keep longer? 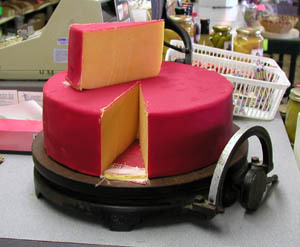 Most hoop cheese is a basic “Farmer’s Cheese” that has been pressed to remove excess moisture, then aged. You will need to wax coat it to age for any time longer than a few days. This article is a wonderful reference for the budding cheese maker. It can teach you the basics and step you up to advanced techniques. I highly recommend progressing step-by-step in each kind of cheese, as they become progressively more advanced. The article was written by: David B. Fankhauser, Ph.D. Professor of Biology and Chemistry at the University of Cincinnati Clermont College. We have a big ole hunk in our fridge right now—blasphemy, I know, but we ferried all eight pounds of it back from THE SMOKEHOUSE in Pine Apple, Alabama the week after Christmas, and want to have a nice big wedge on the buffet for DH’s birthday brunch on Jan. 30. We’ve been shaving off Premium cracker-sized slivers, cutting a big block which we cut into lovely sticks for a munch with crisp apples or grapes, and never fail to put a bowl of the sticks or a wedge onto the breakfast table when we’re having a sweet dish like cinnamon rolls or pastries. The posts on Hoop Cheese have gotten more hits on my blog than any other topic, followed by Fairy Doors. Go figure. I cannot believe I have found people who love my ole “rat cheese” the way that I do. I grew up in Robinson Springs, Alabama – but now am a yankee from Massachusetts. I have NEVER forgotten our old country store with that wheel of rat cheese. The BEST mac/cheese ever. I saw a website Striplings that sells wedges, and I’m going to order some…Man, I miss the south! It really is funny, to me, how many folks have found this site looking for good ol’ hoop cheese. I’m glad so many of you are keeping these old traditions and memories alive. Growing up in AL, well heck being there until I was 29… that’s more than just growing up there (sorry bunny trail) I remember some country corner store/gas stations having a selection of hoop cheese, souse and pickled eggs. And deer jerky out of a big old dirty-lidded jar. Chapman’s in Cottondale sold hoop cheese it until they closed in the 90s. Does Hoop cheese have to be refrigerated? I would. It tends to mush during extended stays at room temperature. Plus, it’s not a very dry cheese. That would make me hesitant as far as bacterial growth is concerned. But, honestly, I’m not an expert in those things. just found the site…wow…also ordered from Striplings…Crackers and cheese; brings back memories for me as well…also had peppermint at Christmas, the huge barber pole, that had a green stripe along with the deep red and skinnier red stripes…found both cheese and barber pole peppermint on the internet. Wow, never thought about cheese cake with hoop cheese, but I will definitely give it a try. Finally, can this cheese be frozen without harm to its texture? I have been able to find Hoop cheese in my local grocery store so maybe its making a comeback. On it’s own a pretty bland tasting cheese but it seems ideal to cook with. Can’t see the forest for the trees. Do you have a recipe for ‘yellow’ hoop cheese? Found plenty for ‘farmers cheese’ but they all ended up being white in color. Looking for that good old yellow greasy cheese one used to find in grocery stores. Thanks in advance for any one who can supply a recipe. Rick, The yellow color is added to white cheese. It has nothing to do with taste in and of itself. Give the white Farmer’s cheese a try to see if it works. There are several recipes available for Farmer’s Cheese. Yellowing can also be a sign that the milk producing animal had a diet high in beta-carotene. (Cows that graze on fresh grass and flowers will have a more beta-carotene enriched diet than cows that eat mostly hay.) Although hoop cheese is almost always fresh, wax dipped hooped cheese can last long enough for the beta-carotene content to darken the cheese more than an undipped wheel. Thanks to all of you for keeping this post alive! I’m glad to know so many people are interested in good ol hoop cheese! I failed to mention that the most common artificial yellowing agent is annato. It’s easy to find in better-quality supermarkets. My late mother-in-law made Cheese Cake, but with plain Hoop Cheese, and about a 1/4 inch thick layer of sweetened sour cream on top. Cheddar Hoop Cheese would impart flavor likely not wanted in Cheese Cake. I would love to make it, but as I do not have my mother-in-laws recipe, I would love to have your Hoop Cheese Cake recipe. Thanks for your help. I was just talking with my daughter about cheese cakes and recalled the first I ever had, made by my Dad’s assistant using hoop cheese with the sour cream glaze. So I started searching and found this blog. If you find a recipe, please share. Never had a better treat! Hoop Cheese is avaiable at MY PUBLIX supermarket in the deli specialty cheese case. Mine too! Also, my local Sam’s club has started carrying it. I recently bought an Old Feed and Seed store in Liberty NC. We sell a great deal of Hoop Cheese and I am looking for an Old computing cheese cutter like the one pictured above. Does anyone know where I could find one? Finding one is going to be a journey. I’d get in touch with the Lehman’s company in Kidron Ohio. They’re a non-electric specialty company in a traditionally Amish area. I don’t think they carry the computing cutters, but they might be able to provide a source to track one down. I’m a big fan of the things they sell. Their catalog brings back a lot of memories for myself and my older family members. Terrific! Been looking for info like this , thanks for posting, Cottage Cheese Diet. Thanks for all the information on Hoop Cheese. I live in a rural area around Lake Gaston in Va. I see a local country store that advertises Hoop Cheese. With all the suggestions on here on how to use it, I am going to get some and give it a try. Thanks to everyone who shared their favorite ways to use and eat this Hoop Cheese. Our favorite purveyor is no more—The Smokehouse at Pine Apple, Alabama, has closed its weathered doors over all those luscious red hoops of cheese, the smoky, perfect Pulled Pork, that incomparable strong yellow slaw, and the ever-sticky tables varnished slick as a Last Supper clock. DH came back from the coast with a trove of immense green peanuts to boil, but alas, no REAL Hoop Cheese. Baw. We enjoyed giving away samples of the yummy Hoop Cheese during our Open House and look forward to having it available to everyone soon. great ode to hoop cheese! hoop cheese is the defining ingredient in scrambled eggs & cheese, and any breakfast biscuits. can find hoop everywhere in rural south. a little harder to find in urban south, but is still out there. i always pick up a wedge when i find it. Great goods from you, man. I’ve understand your stuff previous to and you are just too magnificent. I actually like what you have acquired here, certainly like what you are saying and the way in which you say it. You make it entertaining and you still take care of to keep it wise. I can not wait to read far more from you. This is actually a wonderful site. I Love Hoop Cheese! I live in southwest Georgia and it’s still easy to find at the local grocery store here (Harveys and Piggly Wiggly always carry it), though it is expensive at 5.99/lb. I actually just ate a hoop cheese sandwich. I love the taste and texture, and it’s so good on bread, crackers or melted over cooked dishes. I grew up in Kansas City and didn’t realize how many things in KC are atually southern style until after I married my husband, who grew up in Oklahoma. Hoop cheese was in the local supermarket where I grew up! Now I’m far from home and lots of the cheeses I grew up with is hard to find. I make my own cottage cheese and sometimes press out the whey so it’ll keep longer and it tastes different when I do so. Odd, but familiar. I went looking online for what it could be reminding me of, and now I know. Now if I can only get better at cheese-making…. Does anyone have a cheese cake recipe for hoop cheese? 1 pound graham crackers, processed in food processor into crumbs CRUMBS is an improvisational theatre duo based in Winnipeg, Manitoba, Canada. 1. To make sweet or sweeter by adding sugar, honey, saccharin, or another sweet substance. 2. To make more pleasant or agreeable. condensed milk condensed milk: see milk. For Crust, mix together crumbs and butter until well blended. Pat mixture on bottom and up sides of 9×13-inch baking dish, reserving some of crumb mixture for top of cake. For Cheese Mixture, put cheese through a blender or food processor until fine or put through a strainer. Add egg yolks, sugar, lemon juice, sweetened condensed milk, flour and vanilla, mixing well. Beat egg whites until stiff and fold into cheese mixture. Pour over graham cracker crust. Sprinkle reserved crumb mixture over top. Bake in preheated 350-degree oven 1/2 hour. Reduce oven temperature to 325 degrees F and bake 1/2 hour longer. Turn oven off and after 1/2 hour open oven jar and leave slightly ajar until cake is partially cool. 2. To preserve (food) by chilling. cake until serving. Cut into squares. Makes 1 cheesecake. cake until serving. Cut into squares. Makes 1 cheesecake. I have been listening to my husband go on and on about Hoop cheese for 3 yrs. now. Stories about how the cut it fresh right in the store by a cutter made just for Hoop cheese. I was quite thrilled to find this article. My husband is from South Carolina and claims it is the GREATEST cheese ever!!! Me, being the super critic about cheese, have been searching all over to see if not only can I surprise him with some but also find some for myself to give it a try. I must admit after reading this article I find myself eager to try it. I love milder cheeses that work great with fruits. Grapes cheese and crackers are the best snack ever. I have just been leery about ordering it online because of the life span of the cheese. I have exhausted myself trying to find it locally and very rarely do we get down South. So anyone have any pointers as to ordering cheeses online? Luckily, in Alabama, we can still find it in smaller grocers. Anyone braved an online order before? I have been finding it recently at Costco. It is a huge wedge and $6 a pound but it is so versatile that we go through it pretty quick. It easily replaces american cheese (if your into that) and is great in omelets, anything you might need melted cheese for. I hate processed cheese so hoop cheese is an awesome replacement. I grew up in North East Mississippi and my Great Grandmother used to buy it at a local shop that was a plant nursery. I was very excited to see it in our Costco. We do live in Tennessee but it was the first time I had seen it since I was a young girl. Good luck I hope you find some soon. Sams Clubs are the predominant “bulk members only” stores in my area. Haven’t seen hoop cheese at any of those lately. Guess it’s on a downswing. Hey everyone! Check this out. Online hoop cheese! I grew up in south Mississippi and hoop cheese was a staple in our home. Love it! I now live in suburban Atlanta, and our Kroger sells it. At $7.99 per pound, it is expensive, but worth every penny! I grew up in Mississippi and we always had hoop cheese. The best thing I think I ever ate was when my mom would slice it into an old cast iron skillet put it in the oven and melt it. She would make homemade biscuits and we would put the melted cheese in a biscuit and eat it like a sandwich with our breakfast. Sometimes she would make home made french fries and we would add them to the cheese biscuit. It was great!!! I just moved to NC and my neighbors rave about hoop cheese. I found it at a small produce stand on hwy 50 near Garner. It is a mild cheddar and very creamy. I enjoyed it esp with fruit and crackers. I have seen Hoop Cheese at Layne’s Country Store in Glasgow, Va. I am going to pick some up! Layden’s in North Carolina sells it too. Hoop cheese, BBQ, sausage, etc. may be purchased Monday-Saturday at Smith’s Red & White in Dortches, NC – right off I-95, Exit 141 (Rocky Mount, Dortches, Red Oak)… some of the best in the U.S.! My dad and I would put a large slice of hoop cheese in our coat pockets with crackers and fruit and this was lunch when we were hunting. Miss those days!!! My wife and I were just searching where we might find some hoop cheese, when I came across this blog. She’s from NYC and moved here to Louisiana, I was telling her about going down to the country store and getting some hog head cheese, hoop cheese and some crackers and how good it was. I’m sure she’ll pass on the hog head cheese, once I tell her how its made. Its been a long time since I’ve had some good ole rat cheese. My mom and grandma used hoop cheese in their blintzes but I remember it being a soft cheese almost like cottage cheese. What would be a good replacement for this cheese in our families blintz recipe? My Grandfather sold Hoop Cheese in his general store in Pinetops, NC. Slicer, and scale much like pictured! There were also some largish oval shaped cookies that were served with the cheese. Wish I could find them! IIRC correctly, my father called them Jonnie Cakes, but the were more like shortbread cookies, again, as I recall. And we are fortunate, the local Mom and Pop stores around here all carry Hoop Cheese, both red and black rind. I prefer the black, it is a little sharper. They still sale hoop cheese in Ashe Country, NC at the West Jefferson Cheese Factory. West Jefferson, North Carolina and it is good!! Personally i think genuinely content to have seen your internet site along with look forward to courses amusing times looking at in this article. Appreciate it once more for those facts. I’m impressed, I have to admit. Rarely do I encounter a blog that’s both equally educative and engaging, and let me tell you, you have hit the nail on the head.